Antisemitischer und antibritischer Propagandafilm über den Aufstieg der jüdischen Bankiersfamilie Rothschild Anfang des 19. Jahrhunderts. Als größten Coup der Familie stellt der Film die Lancierung der Nachricht einer angeblichen englischen Niederlage gegen Napoleon bei Waterloo dar. Durch den anschließenden billigen Aufkauf englischer Staatspapiere verdienen die Rothschilds ein Vermögen. Die Schluss-Szene zeigt einen brennenden Davidstern vor dem Hintergrund der Karte Englands. Anti-Semitic and anti-British propaganda film about the rise of the Jewish banker family Rothschild at the beginning of the 19th Century. The family's grand coup is the spreading of a rumor that the English lost against Napoleon at the Battle of Waterloo. The result is a severe downgrading in the value of England's government bonds and after the Rothschilds buy them up at the artificially low price, they make a fortune when the rumor turns out to be false. The final scene shows a burning Star of David atop a background image of the map of England. DVD-R IS IN GERMAN WITH OPTIONAL SUBTITLES IN ENGLISH, ITALIAN, HUNGARIAN, CROATIAN AND POLISH. APPROX. 141 MINS. COMBINED TOTAL. EXCELLENT, DIGITAL FILM QUALITY OVERALL. However: The last 11 minutes of the film appears to be a "stitching" of another print onto the rest of the film and is noticeably softer than the rest of the movie. The film begins with Erich Ponto, the most recognized cast member who was a popular character actor seen in DAS MADCHEN JOHANNA (1935) and DIE FEURERZANGENBOWLE (1944) and after WWII in THE THIRD MAN (1949), cast as Mayer Rothschild, the head of the banking family, making a deal to hide the Mayor of Frankfurt's 600,000 pounds in England from Napoleon and with the help of his sons Nathan in England, and James in France, the family uses this money to build their fortune and finance Wellington's army. Nathan is first seen violating the Sabbath to further the deal and later treated with disdain and blackballing by the snobbish members of the British Stock Exchange when he attempts to ingratiate himself into their business and social world because he's 'not one of them', i.e., a Jew and worse, a foreign one. After Nathan seizes the opportunity to give a rival's wife a ride in his carraige, her husband coldly asks he if wants to be reimbursed and a surprised Nathan says politely "You're trying to insult me." The husband replies: "No, Mr. Rothchild. I'm just trying to prevent you from losing." a dry dig about how Jews stereotypically must be making money every minute of the day. Nathan frets over his risky wheeling & dealing with England and the anti-Napoleon French, and eventually he makes a fortune unlike his brother James's negotiations with the French Chief of Police who must receive high kickbacks for them to do business. Nathan ruins his enemies by spreading the wrong news about the outcome of the Battle of Waterloo to manipulate stock market prices. The Mayor's money is safely returned with a bill for the Rothschild's handling fee and he questions James in how much more they really made off him as "nothing is more disgusting than one pickpocket telling lies to another." The film ends with the Commissioner of the Treasury and a victorious Nathan showing him a map of the world and connects the cities where his family's banks are located by drawing a hexagram then superimposed with a flaming Star of David. The closing title tells us: "By the conclusion of this film, the last of the Rothchilds have left Europe as refugees [due to WWII]. The struggle against their English accomplices, the British plutocracy, continues." Not only is ROTHCHILDS anti-Semitic, it's equally anti-British as outlined in scattered titles. 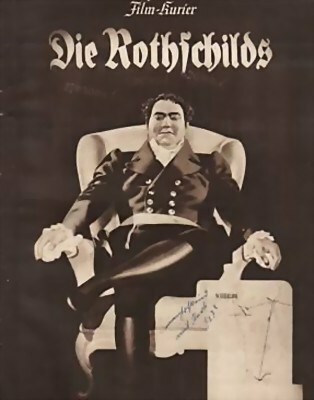 The film's production history should be noted as the film's original title was lengthened later when the film was re-edited: "Beyond its indictment of "Jewish" intrigue and avarice, THE ROTHCHILDS aimed to show the 'Judafication' of British society at Rothschild hands, and thus demonstrate why, in Goebbels' words, Britons had become "the Jews among Aryans." Yet the film's dramatic conventions did not always mesh with its racial politics, and when the film was released in July 1940, German audiences were left unclear as to just who they were mainly supposed to hate. Goebbels had it pulled from distribution; a year later, a much-revised version, purged of any conceivable sympathies for its British characters, was released. The revamped movie was renamed THE ROTHCHILDS' SHARE IN WATERLOO" and this is the only version available. THE ROTHCHILDS' SHARES IN WATERLOO is a provocative costume picture heavy on plot and dialog so you might have to see it more than once to follow the monetary and political intrigue: There's also a love story nicely fitted into the plot to make it appeal to a wider audience. This DVD has very good video & audio quality except for some softness during the last ten minutes but I've noticed that in other prints.